Two opposing scenarios captured my attention recently. The first scenario was seeing the photo of a young woman wading through garbage just to be able to go surfboarding. The visual impact brought me to tears. 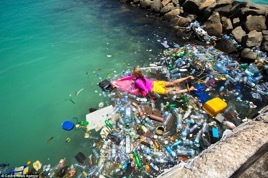 I have posted the photo on the EAG website this month not to shock you but to inspire you into initiating or increasing your efforts towards the reduction of plastic use. The second scenario was the sight of a young father walking ahead of me on his way towards the grocery store entrance stooping to pick up every piece of plastic from the ground to subsequently dispose of it properly.